Dr. William Cohen was the first graduate of the doctoral program that Peter Drucker co-founded. What Drucker taught him changed his life. Shortly after graduating, Cohen was recommissioned in the Air Force and rose to the rank of major general. Eventually, he became a full professor, management consultant, and the author of more than 50 books, while maintaining a nearly lifelong friendship with his former professor. In 2009 he was named a Distinguished Alumnus by Drucker’s school, Claremont Graduate University, and two years later he co-founded the non-profit California Institute of Advanced Management with the mission of offering affordable graduate degrees based on the principles and values of Drucker. He served as its president from 2010-2016. He now serves as president of the Institute of Leader Arts, an international training and consulting company. Consulting Drucker: Principles and Lessons from the World's Leading Management Consultant by Dr. William Cohen is a book written primarily about Peter Drucker. In Consulting Drucker, Cohen -- who happens to have known Peter Drucker personally as a student as well as a friend, and who also happens to have officially trained under him -- talks about the lessons he learnt from Drucker in business management as well as in life. The book is organized into several chapters, each going in depth into various aspects of Drucker’s management strategies and outlook, as well as exploring his personal side, such as how he made his mark as one of the world’s leading independent consultants, how to look at a business as being primarily about customers and after that about profit, his personal code of rules and ethics, asking the right questions, how to innovate successfully, as well as his personal outlook and habits. There is also a section devoted to essays on Drucker’s consulting by people from various fields and businesses. 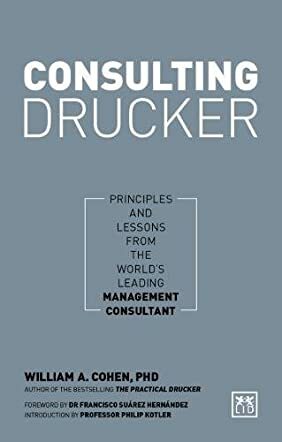 Consulting Drucker: Principles and Lessons from the World's Leading Management Consultant is a well-written book and explores the topic pretty thoroughly. There are a lot of small details included in the book about Drucker’s personal as well as professional life, which add flavor to the book. I enjoyed reading about Dr. William Cohen’s initial introduction to Peter and his innovative management consulting model which rightly focuses on people first. Dr. William Cohen is probably well suited to write such a book and he does justice to it with an engaging writing style and fluid organization of the book. For students and potential business consultants, this book will surely help them learn and advance in their fields.